Soft Amber. Brown Cinnamon. Deep Copper. Chesnut Blonde. Would you use any of these generic box-dye terms to describe your hair color? Um, no thank you. Pick a hair color to emphasize your vivacious and high-spirited personality. If friends are constantly asking, "why are you so extra (insert your name here)," but you honestly don't know why then common hair hues like Light Mahogany Chestnutt and Natural Black just won't do. A shade named VooDoo Blue, Cotton Candy Pink, or Tantalizing Turquoise is more suitable. Maybe a mixture of all 3 since you're so unique? If you're nodding along in agreement then crown yourself with this rainbow ombre wig like a true mermaid queen stuck on land. This wig has interior elastic tabs which adjust easily to create a comfortable fit for everyone. Created from synthetic hair, this accessory features a cascading ombre rainbow of pink, indigo, teal, and yellow hues. The long wavy style is ideal for women who want a fairytale-inspired and free-spirit type of hairstyle. 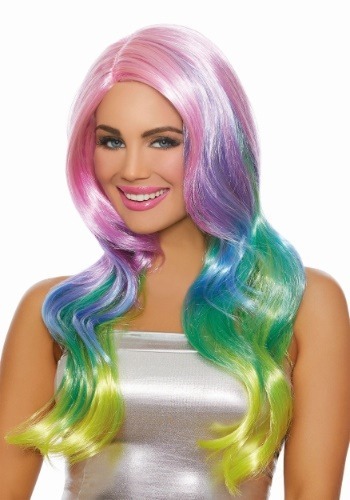 Add to your prismatic new hairstyle by choosing an equally beguiling costume this year. Our top costume choices include a mythical unicorn costume, a bedazzling sea siren costume, or a rainbow fairy costume.